If you plan to getting a little extra spring in your steps the next time you walk out of the home, why not consider the Titanium Spring Loaded Insoles? Built with five titanium springs that not only cushion and support the foot, these insoles return some of the energy of the downward footfall back up to the body for a “push off” with every stride. The suspension coils are only 1/4″ thick, making them just as suitable for athletic shoes as for work boots, and undetectable until a step is taken. Many foot and ankle ailments stem from the impact of the body’s weight while walking, which is why the five coils are positioned directly underneath the heel. The titanium construction ensures the springs will never wear down or lose their shock-absorbing capability. Seven smaller springs under the ball of the foot further disperse the impact and cradle the foot. 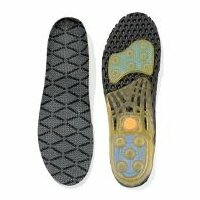 The insole also features honeycomb padding with valves that draw in and expel air during walking for constant circulation to keep the shoe dry and skin healthy. Choose from Small (Men’s 3-7; Women’s 4 1/2-8 1/2), Medium (M 8-10; W9-11 1/2), or Large (M 11-13; W 12-14 1/2) sizes for $29.95 per set.